​ST. PAUL — Minnesotans will see newly designed driver’s licenses and ID cards in the coming weeks as the state transitions from the current cards that were first issued in 2004. The Minnesota Department of Public Safety Driver and Vehicle Services division (DPS-DVS) will begin issuing the newly designed cards for applications or renewals processed on or after August 6. Minnesotans do not need to obtain a new driver’s license or ID card unless their current card is expiring or they need to change their address or name. The current design and new design will be in circulation for the next four years, and both are valid forms of identification until they expire or are canceled. The cost for Minnesotans to apply for or renew a license will remain the same. The new cards feature the State of Minnesota branding and colors. Under 21 cards will be vertical, making it easier for businesses to identify those not able to make purchases that are prohibited to minors. Different color headings will identify instruction permits, commercial driver’s licenses and other card types. A “ghost image” in the lower right corner is a repeat image of the cardholder’s portrait. A multi-colored and intricate background featuring the Mississippi River, a canoeist and a pine forest. An image of a walleye embedded into the card stock that can be observed by holding the card up to a light source. 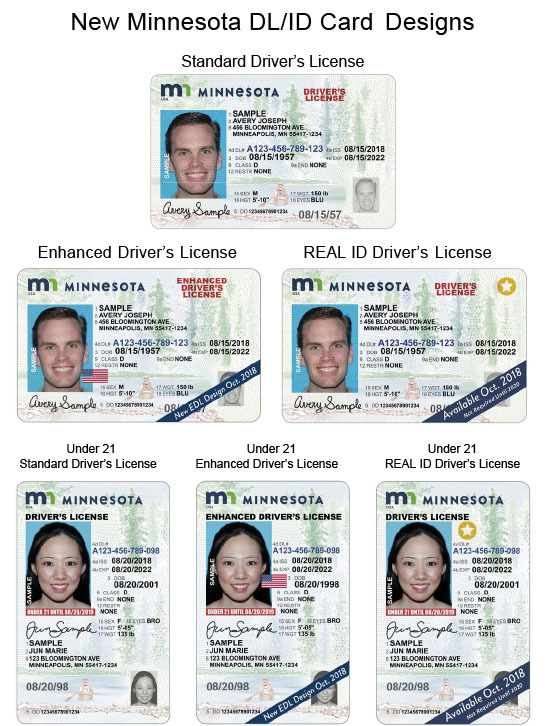 The new design will be applied to all driver’s license and ID cards issued by the State of Minnesota, including REAL ID-compliant cards and the Enhanced Driver’s License and ID cards. Minnesotans will be able to apply for a REAL ID-compliant card in October 2018, but they will have two years to obtain one if they choose. That means Minnesotans will be able to use their standard licenses and ID cards for federal purposes, including boarding domestic flights, until October 1, 2020. The U.S. Dept. of Homeland Security (DHS) informed DPS-DVS during a compliance check-in earlier this year that the state was making the necessary progress to comply with the federal regulations. The Minnesota Legislature passed a law that directs DPS-DVS to make REAL ID-compliant driver’s licenses and identification cards available by Oct. 1, 2018. Work to meet that deadline continues, even though the federal government won’t require driver’s licenses and IDs to be REAL ID-compliant until Oct. 1, 2020. DPS-DVS and Minnesota IT Services (MNIT) contracted with FAST Enterprises to develop a new driver services system that will produce REAL IDs. REAL ID is a federal requirement that establishes minimum security standards for state-issued driver’s licenses. When available in October 2018, REAL ID will be one of three options for Minnesotans when they renew their driver’s license or ID card. Information about REAL ID is available on the DPS website. The Enhanced Driver’s License (EDL) and Enhanced ID Card (EID) are dual-purpose optional cards that allow Minnesotans to re-enter the U.S. at land and seaports when returning from Canada, Mexico, Bermuda or the Caribbean. EDLs and EIDs were first made available to Minnesotans in February of 2014 and remain available for Minnesotans who chose that option. The new design will be applied to EDL and EID cards beginning in October. More information about the EDL and from what countries Minnesotans can re-enter the U.S. is available on the DPS website. EDLs are an acceptable form of identification to board an aircraft or enter a federal facility now and after October 2020. There is no need to obtain a newly designed driver’s license or ID card. The current design and new design will be in circulation for the next four years, and both are valid forms of identification until they expire or are canceled. Minnesotans whose driver’s licenses or identification cards expire before October 2018 should plan to renew their cards as they normally would. The renewed license will ​be valid for four years, barring a suspension or revocation. Minnesota has a few identification options from which residents may choose. Determining which type of license or ID card works best depends on what a person needs to use the card for. Standard driver’s license or ID card. Enhanced driver’s license or ID card (EDL/EID). REAL ID-compliant driver’s license or ID card (coming in October 2018). Information from the U.S. Dept. of Homeland Security. REAL ID Frequently Asked Questions for the Public. A recent DPS Blog post has information about if your license expires this summer. More than 1.6 million driver’s license and ID cards issued. More than 1.6 million titles issued. More than 5.4 million vehicles registered.